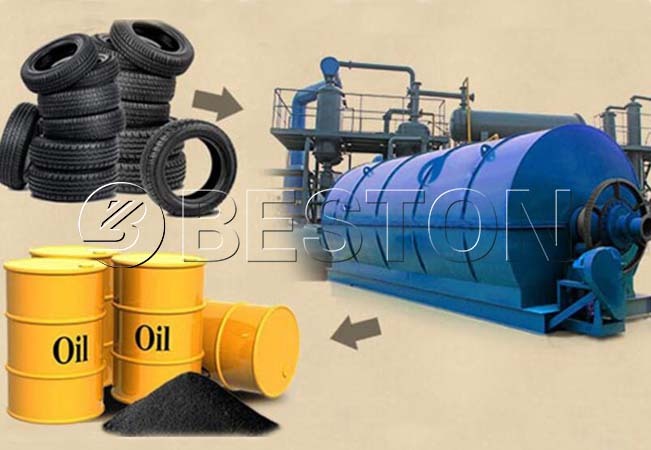 Waste tyre recycling plant of Beston Machinery is highly favoured by clients for old tire disposal, because it converts scrap tire into many useful things, such as oil, rubber powder to bring you great benefits. 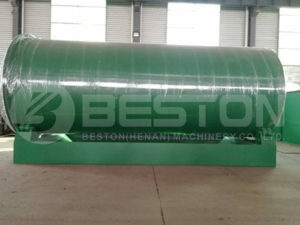 More importantly, Beston Group is a professional waste tyre recycling machinery in China, which constantly updates the tyre recycling technology. 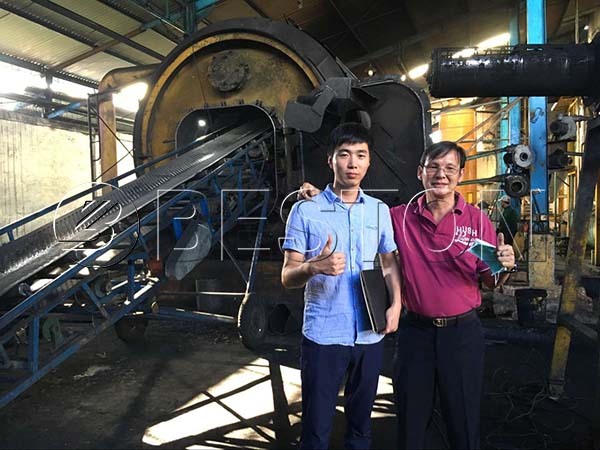 Today we can provide customers with complete tire recycling systems, including the top-quality tire recycling equipment, the most cost-effective old tyre recycling plant business plan, the reasonable price and full service, etc. We have rich experience in manufacturing and exporting these pieces of equipment. 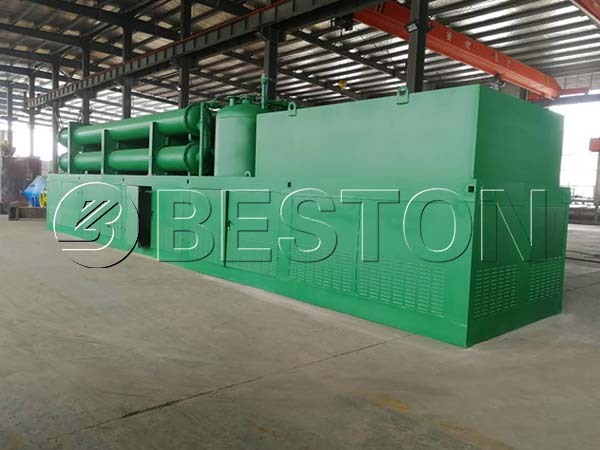 For instance, Beston Machinery is specializing in the production of waste tire pyrolysis equipment to convert tires into oil. Moreover, our pyrolysis plant is also applicable to recycling waste plastic, oil sludge, medical wastes, etc. The tire-derived fuel can be applied to the brick factory, lime plants, steel mills to give you high and quick returns. 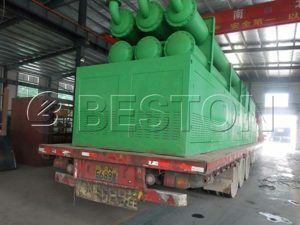 Beston Machinery can supply the entire recycling system from waste sorting machine, through pyrolysis plant, oil distillation machine and carbon black processing machine. All these machines can be supplied individually and completely. You can just choose the equipment according to your needs. The waste pyrolysis plant is one best way to dispose of old tires. Furthermore, we have adopted the best tire recycling technology to make our tires recycling machines safe and free from pollution, even under the strict EU3 emission standard. Therefore, wherever you are, you can just choose Beston products without pressure for environmental protection. 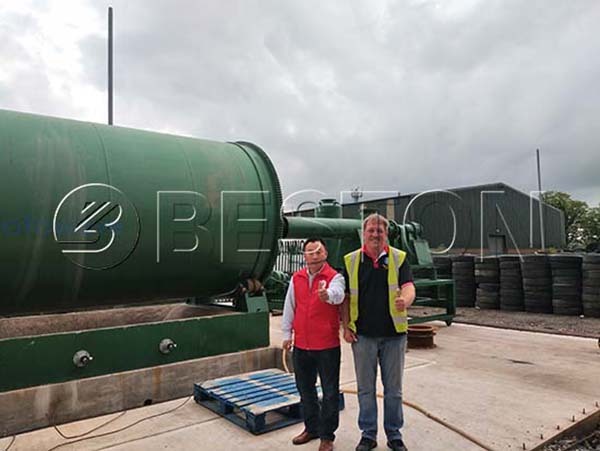 Here are some successful cases of Beston waste tyre recycling plants around the world. You may find many used tires recycling companies, but you have no idea about how to choose an ideal scrap tyre recycling plant. 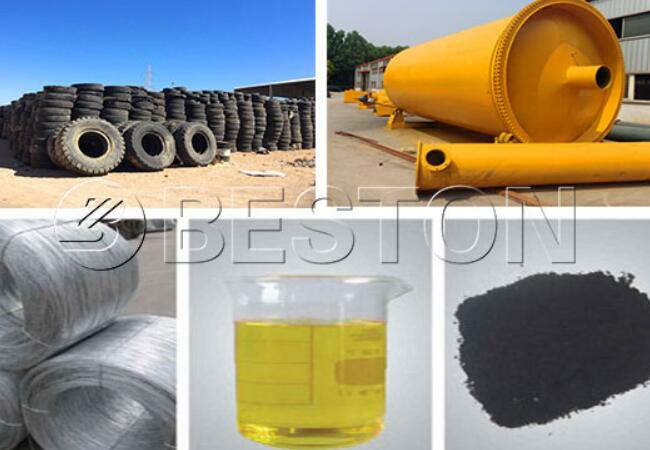 While Beston is an experienced and professional waste tyre recycling plant supplier, which can offer you the most suitable business plan for old tire recycling. We have the excellent engineers, designers and sales team. Our elite team will work out a specific plan on the basis of your requirements and real conditions. During installation and the whole service life, our engineers will be there for you if you need. In addition, we have successfully exported our products to many countries around the world, such as UK, Russia, Uzbekistan, South Africa, etc. With rich exporting experience, we can solve any possible problems to reduce your costs and time. All in all, Beston promises you with the best pre-sales and after-sales services. 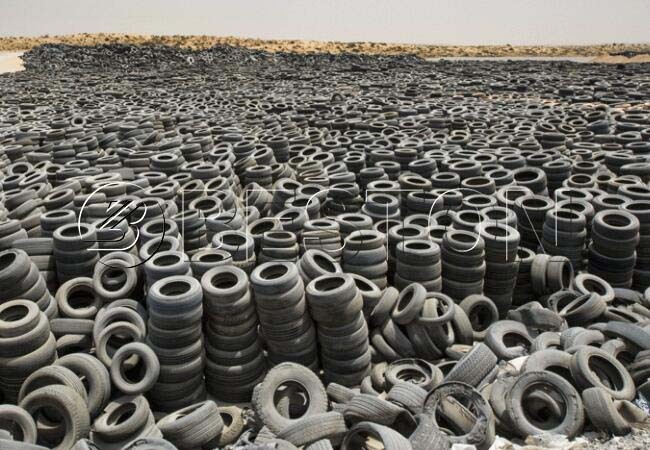 If you want to start a tyre recycling business, just contact us now! What Is Waste Tyre Recycling? Before we introduce the key machines employed in a waste tyre recycling plant, let’s see what used tyre recycling is. Waste tyre, known as “black pollution”, is a kind of polymer material, which is difficult to degrade naturally. Moreover, it will not even be decomposed when it is abandoned to the surface or buried underground. While simple incineration can effectively reduce the number and volume of old tires, but the poisonous gas seriously pollutes the atmosphere and endangers the environment. Therefore, used tire recycling has become an important and urgent problem. How to Recycle Old Tires? At present, efforts are continuing to find value. In general, there are three main methods of waste tyre disposal, namely, overall utilization, reclaiming and pyrolysis. Overall utilization usually refers to retrofitting used tyres. While pyrolysis can be used to reprocess the tires into fuel gas, oil, solid residue (char), steel, low-grade carbon black, etc. In terms of deep processing, we also supply the related equipment to produce activated carbon and tyre oil to diesel. On this basis, let’s see the Beston waste tyre recycling plant for sale. One of the key equipment of waste tyre recycling plant is pyrolysis machine. It is applied to convert tire to oil. 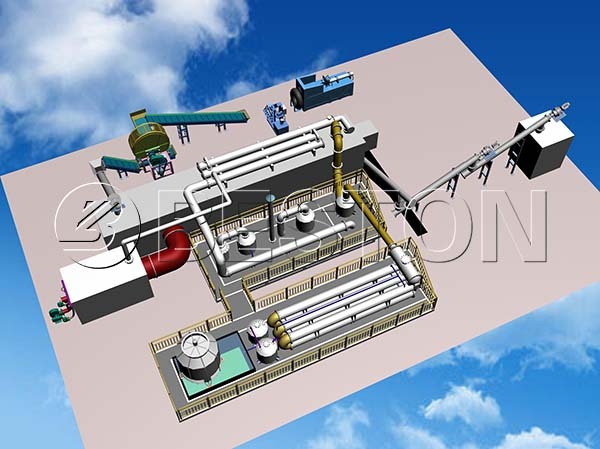 Here is the specific waste tyre pyrolysis process from Beston Machinery. Cut the old tires into small pieces and put the small tyre pieces into the reactor by full-automatic feeding machine. Heat the pyrolysis reactor by burning the fuel material. Then the oil gas will be released when the temperature reached 200℃. And 280-350℃ is the top output rate interval in the tyre pyrolysis process. The heavy oil gas separated by manifold is supposed to be liquefied and drop down into the heavy oil tank. The lighter gas will rise up to the oil condenser, then be liquefied into oil and stored in the oil tank. While the incondensable combustible gas through desulphurization and dedust by hydro seal will be led to heat the pyrolysis reactor. Our reactor is well-designed to make full use of the heat inside to reduce energy consumption. That’s why Beston can be one of the top waste tyre pyrolysis plant suppliers around the world. 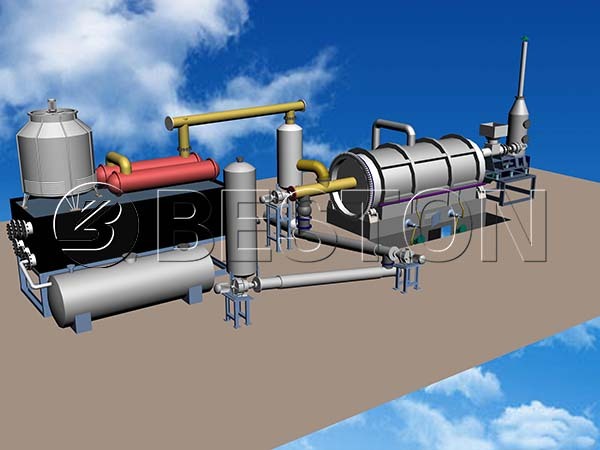 Here are two different types of Beston waste pyrolysis reactors. Carbon black will be discharged automatically. Besides, the gas finally out to the air is processed by the extra gas recycling system. We can make sure there is no gas pollution. Here is a 3d fully continuous waste tyre recycling plant video made by Beston Machinery to help you know clear the whole pyrolysis process of scrap tires. 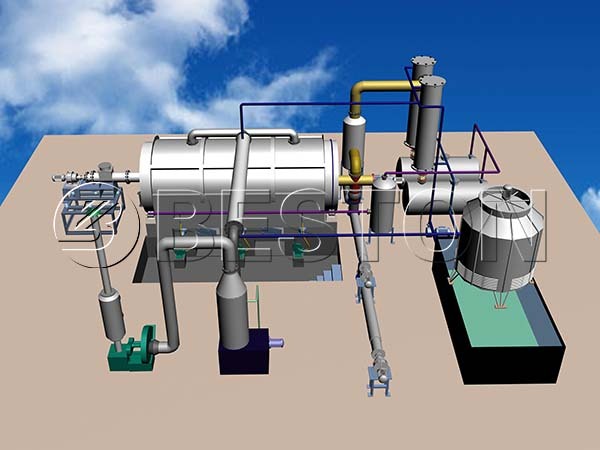 The direct end product of waste tire pyrolysis plant is pyrolysis oil. However, it is distinctly different from petroleum products. It can be added to heavy oil generator to produce electricity. We can also upgrade it to diesel or gasoline by oil distillation equipment. There is a wide application of this kind of oil to bring you high returns. Moreover, selling the fuel oil to the market is also feasible. As the energy crisis becomes more and more serious, this method can ease the crisis to some degree. Carbon black is widely used as a model compound for diesel soot for diesel oxidation experiments, as well as a reinforcing filler in tires and other rubber products. In plastics, paints, and inks, carbon black is applied as a colour pigment. You can reprocess it into color masterbatch, coal or refractory briquette, all of which are useful in industry. The carbon black processing plant is available if you have the will to reprocess the carbon black. It can heat the reactor after the recycling process. Using the combustible gas can reduce the energy cost. You can process it into steal billet by hydraulic press-packing. 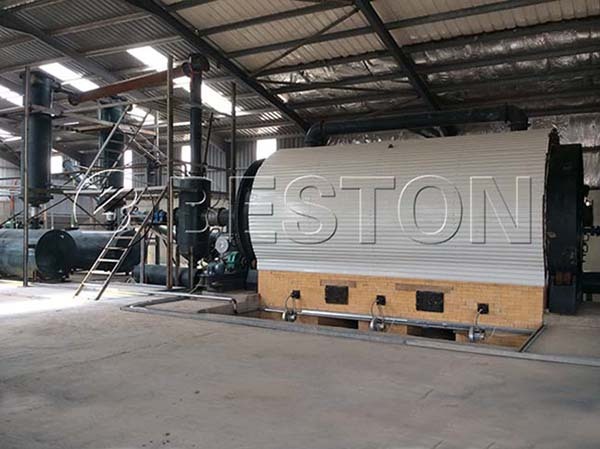 Moreover, Beston waste tyre pyrolysis plant is not only suitable for the scrap tyre pyrolysis. 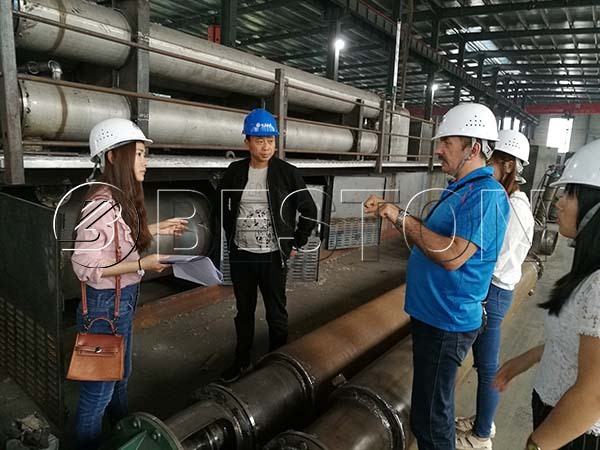 It also shares the similar working process of waste plastic pyrolysis, waste oil sludge treatment and medical waste pyrolysis. 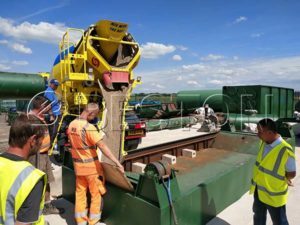 What Can You Expect for Beston Waste Tyre Recycling Plant? 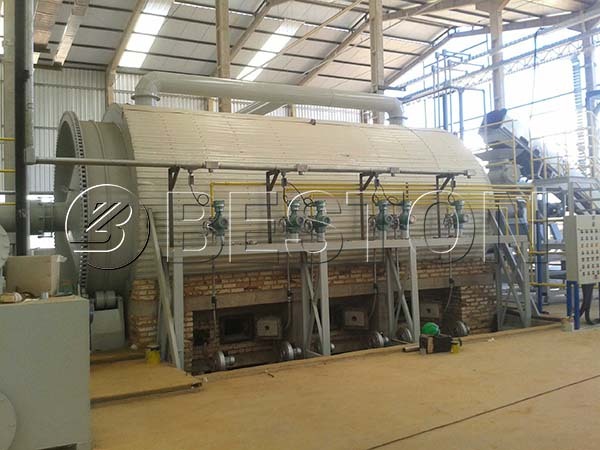 We provide you with the stable waste tyre pyrolysis plant to help you in waste tyre recycling. For now, we have three types of waste tyre recycling plant for sale, namely, batch, semi-continuous and fully continuous plants. The daily capicaty varies from 6 to 30 tons. In recent years, we have successfully installed our waste tyre recycling plant worldwide, including South Korea, the Philippines, South Africa, the UK, Brazil, etc. With the best quality waste tyre recycling equipment and services, we can also promise you the best price to optimize the cost of your recycling plant. What’s more, we are also professional in waste plastic treatment, oil sludge treatment. As you see above, there are different ways to recycle old tires into wealth. 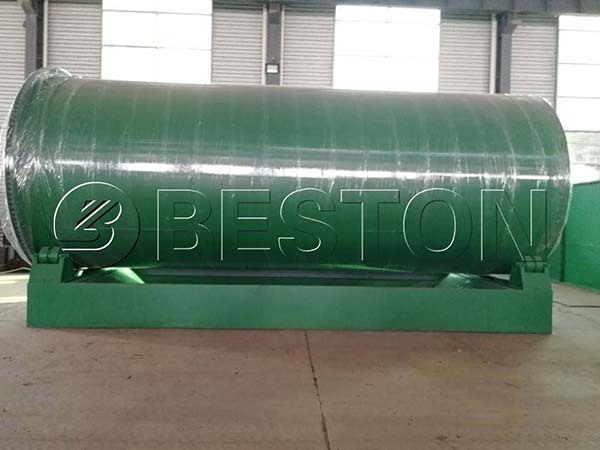 Beston (Henan) Machinery is a leading waste tire recycling plant supplier, which always provide customers with the best products and services. Just send us an inquiry to know more about our waste tyre recycling plant!